Home » Health » What Is Bird Flu? Bird Flu is a type of influenza disease transmitted by birds to humans. 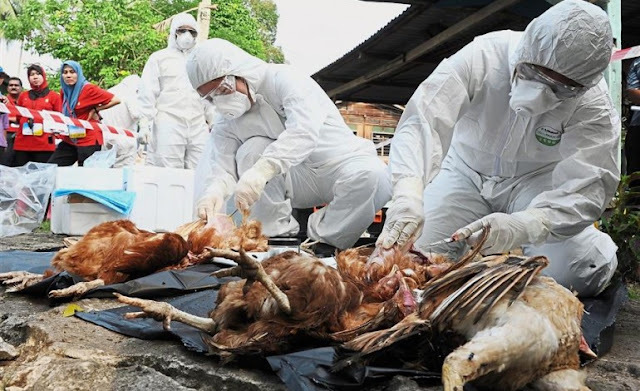 Two types of Avian Influenza Viruses, namely H5N1 and H7N9, have caused epidemics in Asia, Africa, the Middle East and parts of Europe to date. Acute respiratory distress syndrome . Multi organ failure (eg heart problems and kidney dysfunction). Are You Know : What Is Glandular Fever? The bird flu virus is an influenza virus that actually attacks birds, both wild birds and livestock poultry (chickens, ducks, geese, or birds). Avian influenza virus infection in humans was first reported in 1997 with the H5N1 virus. Another type that can also infect humans is the H7N9 influenza virus, which was first reported in 2013. Several other types of avian influenza viruses that can attack humans include H9N2, H7N7, H6N1, H5N6, and H10N8. Touch infected birds, both living and dead. Contact with sick body fluids, such as saliva. Or accidentally inhale the spark of body fluids. Contact with dust from sick poultry manure that has dried or inhaled it. Eat meat or eggs without cooking until they are completely cooked. Eating meat and cooked eggs will not make you contract the bird flu virus. In addition, the same danger lurks when we visit the poultry market with a poor level of cleanliness. Transmission from person to person is not yet clear. H5N1 bird flu until October 2017 has infected 860 people worldwide and caused deaths to 454 people. In Indonesia alone, cases of bird flu in humans were first spread in 2005. Until October 2017 there were 200 reports of cases of H5N1 bird flu in Indonesia, with 168 deaths. See a doctor immediately if you experience symptoms, such as coughing, fever, and aches. Especially if these symptoms are felt after contact with birds. After that, the doctor will match the symptoms felt by patients with clinical signs in bird flu. If the doctor suspects the patient has contracted bird flu, further examination in the laboratory needs to be done to confirm it. This check is to check for a virus in the swab or swab of the patient's nose or throat. Another examination that needs to be done is a chest X-ray. Usually if the results of laboratory tests and X-rays are normal, then the possibility of the patient not suffering from bird flu. Patients who have been proven to suffer from bird flu will usually be treated in an isolation room in the hospital to avoid transmission. Besides being advised to drink plenty of fluids, eat healthy foods, take a break, and take painkillers, doctors also usually give antiviral drugs so that the disease does not develop more severely. Examples of antiviral drugs that can be given in cases of bird flu are oseltamivir and zanamivir . Oseltamvir is the drug of choice. Actually, both of these drugs are intended to treat common cold and are very effective if the use does not exceed two days after symptoms appear. This drug can be given as soon as possible after the patient tested positive for bird flu. Besides being useful for treatment, oseltamivir and zanamivir can also be consumed as drugs to prevent bird flu, especially given to medical staff who handle patients with this disease and to those whose daily activities are close to poultry. One complication that can occur in cases of bird flu is pneumonia . Additional oxygen and breathing apparatus or a ventilator will be needed in patients who experience pneumonia with difficulty breathing. In addition, administration of antibiotics will be given until pneumonia heals. When bird flu spread in Indonesia, the government made many countermeasures. Among them is by distributing oseltamivir drugs at each referral hospital for bird flu, conducting training for doctors and nurses about the treatment of bird flu in hospitals, and actively conducting surveys and taking samples of people at risk of contracting bird flu. The spread of the bird flu virus is indeed difficult to prevent. But apart from that, we must continue to do things that can reduce the risk of contracting. Some simple examples are always keeping hands clean, maintaining clean cages when we raise poultry, making sure to eat well-cooked poultry meat or eggs, and not consuming wild birds hunted because we don't know what diseases might be present in the body they. Buy poultry that has been cut in a supermarket or traditional market that is well maintained. Meat ready to cook will minimize the risk of bird flu because we do not have to bother cutting, plucking, or cleaning the contents of the poultry. As much as possible, avoid living poultry stalls in the market that do not apply cleanliness properly. Until now there is no specific vaccination for the H5N1 flu virus. But you can vaccinate flu every year to reduce the risk of viral mutations. If necessary, also include pneumococcal vaccination to prevent pneumonia, which is a complication of bird flu. 0 Response to "What Is Bird Flu?"